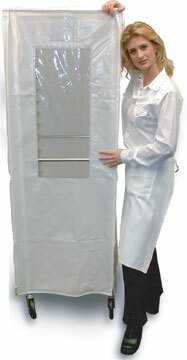 Keep your baked goods clean and sanitary with our deluxe rack covers. These durable vinyl covers eliminate the need for wrapping products individually. Save money by replacing disposable covers with these long-lasting covers made of heavy vinyl. Choose between our Clear Vu™ Rack Covers and our Woven Rack Covers. Clear Vu™ Rack Covers: 12 mil.vinyl Two full length front panel heavy duty zippers for easy access Offers full visibility Size: 23" x 28" x 63" Woven Rack Covers: 15 mil. Reinforced vinyl Two full length front panel heavy duty zippers for easy access Woven cover is opaque to block out light but has a Clear Vu™ window for visibility Size: 23" x 28" x 63"